Due to weather and other circumstances the completion date is now anticipated to be January 15, 2015. The NJDEP Division of Fish and Wildlife is notifying boaters, recreational and commercial fishermen and divers that thirty-six thousand cubic yards of dredge rock obtained from the Port Authority of NY & NJ, Howland Hook Marine Terminal Berth Deepening Project, will be deployed on the Shark River Reef Site beginning November 24 through December 31, 2014. 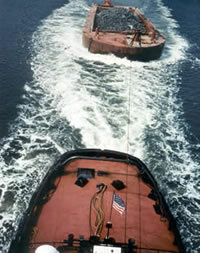 The shale rock will be transported to the site and deployed by hopper scow at predetermined locations. In total, 10 hopper scow loads of rock will be deployed on the reef site as part of the division's Artificial Reef Program. A hopper scow of rock being towed to reef site.